Click here to view the Center’s Annual Report for 2017 [a new window will open]. In commemoration of the 70th anniversary of the Universal Declaration of Human Rights, International Center for Law and Religion Studies Director Brett Scharffs, Founding Director Cole Durham, Associate Director Gary Doxey, and International Advisory Council Chair David Colton — under the auspices of the European Academy of Religion, with the leadership of Ján Figel’, Special Envoy for Freedom of Religion or Belief Outside the European Union, and with co-conveners Carmen Asiaín Pereira, Heiner Bielefeldt, Tahir Mahmood, Alberto Melloni, Dicky Sofjan, Renáta Uitz, and Robin Fretwell Willson — assembled an international group of scholars and human rights experts in Punta del Este, Uruguay, 2-4 December 2018, to prepare the Punta Del Este Declaration on Human Dignity for Everyone Everywhere. PUNTA DEL ESTE, URUGUAY, December 5, 2018. Prominent experts and government leaders specializing in human rights and constitutional law from around the world gathered in Punta del Este from December 2-4 to remember, reaffirm and recommit the world to human dignity as the foundational principle of human rights by issuing the Punta del Este Declaration on Human Dignity for Everyone Everywhere. The conference commemorated the seventieth anniversary of the adoption of the Universal Declaration of Human Rights by the United Nations General Assembly on December 10, 1948. The purpose of the Declaration is to broaden support of human rights and to emphasize their universal and reciprocal character. On January 4, 2019, Center Director Brett Scharffs participated in a panel at the Association of American Law Schools (AALS) Annual Meeting held in New Orleans, LA. The panel on “Anti-Globalization and International Law,” was co-sponsored by both the AALS Sections on International Human Rights as well as International Law and followed the Annual McGeorge School of Law Breakfast for International Law faculties. Panelists were Jarrod Wong (Moderator; Co-Director, McGeorge Global Center); Kate Baragona (World Bank; McGeorge alumna and Vice-Chair of the McGeorge Board of International Advisors); Sharmila L. Murthy (Suffolk); Brett G. Scharffs (Brigham Young University); and Milena Sterio (Cleveland-Marshall). The panelists discussed what impact the gathering anti-globalization movement has on international law in such diverse areas as foreign investment, human rights, climate change, international criminal law, and international and infrastructure finance, and how they are reflected in our pedagogy, scholarship and programming initiatives. Professor Scharffs talked about the Initiative resulting in the Punta del Este Declaration for Human Dignity for Everyone Everywhere. 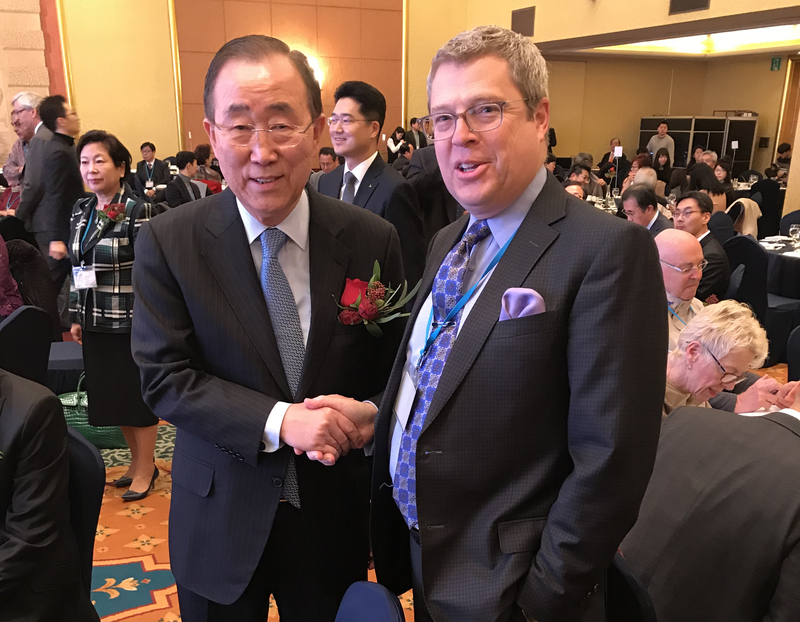 Director Brett Scharffs joined more than 200 global religious leaders, politicians, and experts in Baghdad, Iraq, November 10–11, 2018, for a conference designed to raise worldwide support to end religious persecution. Organized by the AMAR Foundation, a charity based in the United Kingdom, the Baghdad conference was part of a series of meetings held in England and Salt Lake City, Utah, United States over the past two years. Sharon Eubank, director of LDS Charities, spoke at the conference. LDS Charities partners with AMAR to help restore the spiritual and temporal needs of the Yazidi communities in Lalish and Sinjar, Iraq. Pardubice University’s Department for the Study of Religions and the International Center for Law and Religion Studies at Brigham Young University’s J. Reuben Clark Law School co-sponsored the conference, “State Responses to Security Threats and Religious Diversity: What Future for Europe in the Beginning of the 3rd Millennium?” The conference was held in Prague, Czech Republic on November 26-28, 2018. The J. Reuben Clark Law Society and the International Center for Law and Religion Studies presented the 2018 International Religious Liberty Award to Rabbi David Saperstein for his many years of work defending and supporting freedom of religion or belief for all. The award was presented by W. Cole Durham, Jr., ICLRS Founding Director, at the Ninth Annual Religious Liberty Award Dinner held on October 11, 2018 at the Monaco Hotel in Washington, DC. Rabbi Saperstein delivered the keynote address. The International Center for Law and Religion Studies (ICLRS) at BYU Law School in Provo, Utah, USA, launched a new program during summer 2018, training young scholars, academics, and government officials in religion and the rule of law. The program too place at Christ Church, Oxford University from July 22 through August 10, 2018.
International Program participants are chosen each year from human rights and comparative law backgrounds. The members of this charter class included lawyer-scholars and students from Netherlands, Argentina, Bangladesh, Brazil, Canada, China, Greece, Israel, Poland, South Africa, Turkey, Ukraine, and Vietnam. Erin Cranor’s first interaction with the International Center for Law and Religion Studies was while attending the Religious Freedom Annual Review in the summer of 2016. She was serving on the school board in Las Vegas and attended the conference to gain more insight into protected class legislation around sexual orientation and gender identity issues as well as looking for ways to promote civility in the conversation. A year later she would return to Provo as a first year law student and spend the summer of 2018 assisting in the organization of the Religious Freedom Annual Review and serving an externship at the Office of General Counsel, The Church of Jesus Christ of Latter-day Saints, in Salt Lake City. The International Center for Law and Religion Studies hosted a launch of the book The Kokkinakis Papers: Taking Stock of 25 years of ECHR Jurisprudence on Freedom of Religion or Belief at the conference Between State and Citizen: Religion at the ECtHR, held 4 May 2018 in Athens, Greece. Center Director Brett Scharffs participated on a roundtable discussion at the conference – “Do we need the ECtHR to protect religious freedom?” – with participants Nicos Alivizatos, Malcolm Evans, Ronan McCrea, Renáta Uitz, and Lucy Vickers, moderated by ICLRS Founding Director Cole Durham. On April 22-23, 2018, the Center sponsored its first Middle East regional conference. Held at the University of Jordan in Amman, Jordan, the theme of the conference was “The Amman Message in a Changing World,” a retrospective look at The Amman Message, a vision of peaceful Islam promulgated by King Abdullah II of Jordan a decade ago. The conference was sponsored by the Center, the University of Jordan Law School, and BYU Religious Education. BYU Women’s Conference, held annually, is the largest two-day gathering of LDS women anywhere in the world. This year’s conference was held May 3-4, 2018 on the Brigham Young University campus in Provo, Utah. The theme was “Strengthen One Another in the Lord.” Approximately 160 presenters participated and 18,458 people attended. Disclaimer: The views and opinions expressed in this talk are those of the authors and do not necessarily reflect the views of Brigham Young University or The Church of Jesus Christ of Latter-day Saints. The presentation included lively Q&A and provided a great opportunity to discuss current US church-state law and recent developments. The Ukrainian scholars were particularly interested in current attitudes towards religion in the US, the US’s history of anti-Catholic bias, and understanding the development of current First Amendment case law. 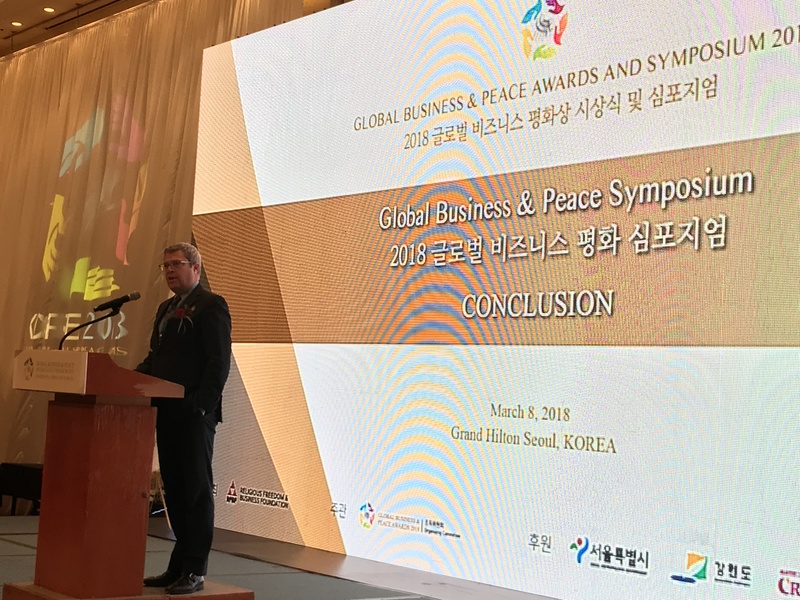 The International Center for Law and Religion Studies was among the sponsors of the 2018 Global Business & Peace Symposium held 7-8 March in Seoul, South Korea. Center Director Brett Scharffs participated in the event, delivering a closing address. 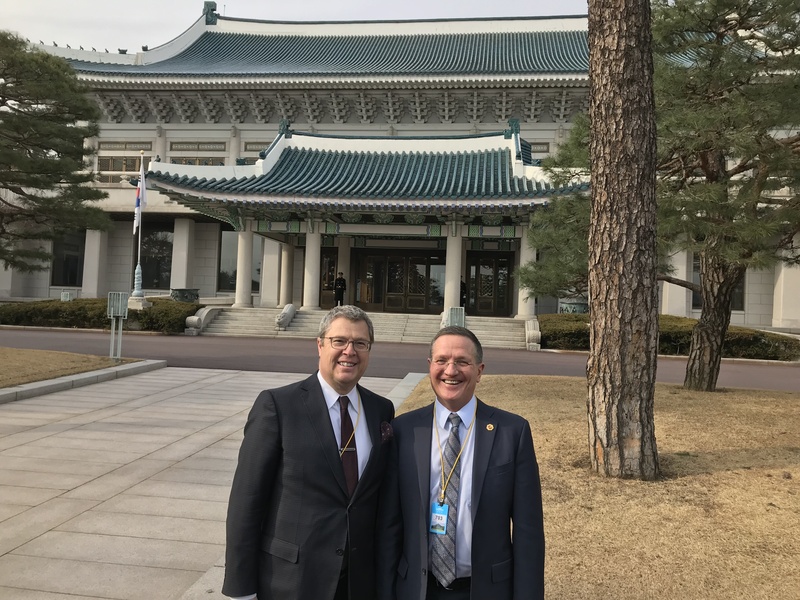 In connection with the Symposium, Professor Scharffs joined Brian Grim, President of the Religious Freedom & Business Foundation, as part of the Peace Delegation attending high-level meetings at the Korean National Assembly (Parliament), the Presidential Blue House, and with the Mayor of Seoul on March 7. 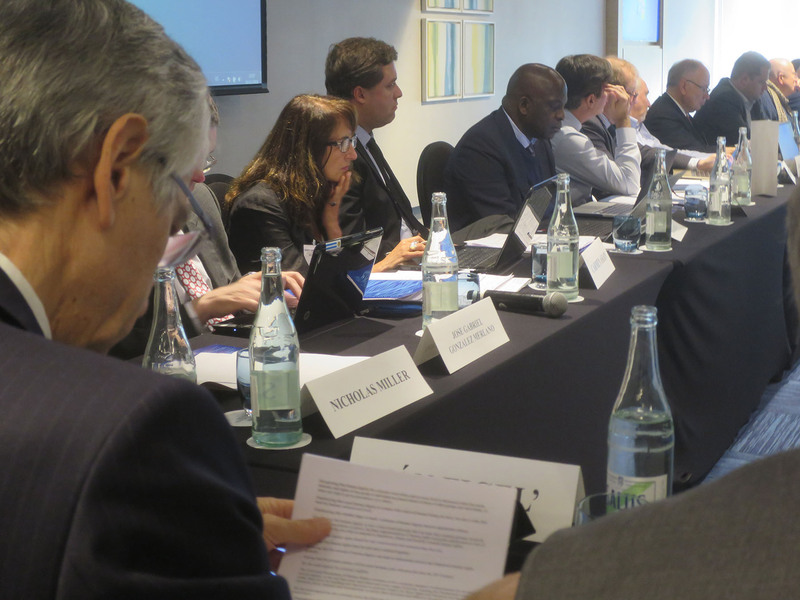 From 14 to 16 February 2018, Professor Brett Scharffs, Director of the International Center for Law and Religion Studies, and Center Senior Fellow, Neville Rochow SC, participated in a major conference in Sydney and Adelaide Australia. The conference featured leading academics and experts from Australia, the Pacific, the United States, Canada, the United Kingdom, and the European Union, addressing the conference theme: ‘Freedom of Religion or Belief: Creating the Constitutional Space for Other Fundamental Freedoms’. The Center partnered in the conference with the University of Adelaide Law and Religion Project, Research Unit for the Study of Society, Ethics and Law and University of Notre Dame of Australia, Sydney School of Law. Its key organisers were Neville Rochow SC and Professor Paul Babie of the University of Adelaide. The first two days of the conference were held at the Sydney campus of the University of Notre Dame of Australia. The last day was held in the Moot Courtroom of the Adelaide Law School. The timing of the conference came at a critical point in Australia’s constitutional history: the Australian Prime Minister has recently appointed an expert panel to report on whether and how Australia should change its laws to better allow for freedom of religion or belief. That Panel is due to report in early April 2018. The Panel approached the conference organisers to have a roundtable session on the subject with leading academics and other experts who were present at the conference. 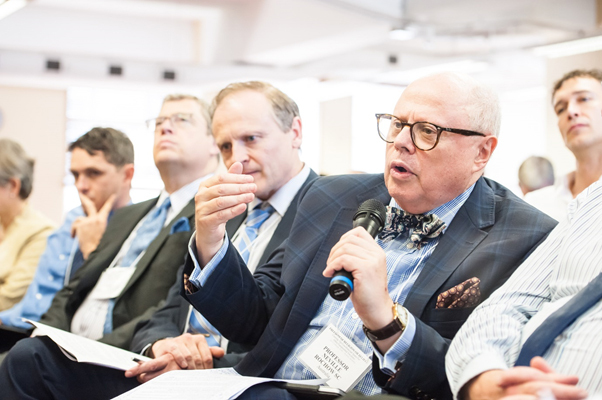 Both Professor Brett Scharffs; and Senior Fellow and Neville Rochow SC from the Center were among those specifically asked to make oral submissions to the Panel during the roundtable session. Neville Rochow was asked to make the first oral submissions at the roundtable session. Subsequently, one of the Panel members approached separately him to inquire about his experiences in the European Union with Article 17 of the Lisbon Treaty. The Panel was particularly interested in Professor Scharffs’ experience in the United States and asked him to expand upon the politicisation of freedom of religion that had occurred there. Soon after the conference, the organisers received an invitation from the European Parliament to express interest in a research project with the European Parliament and to consider the possibility of participating with the Parliament in a conference in Brussels. 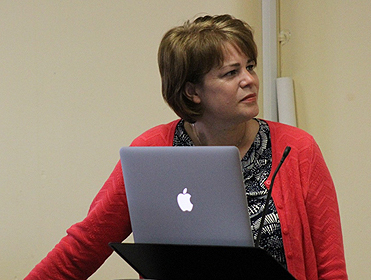 Sharon Eubank, Director of LDS Charities and First Counsellor in the General Relief Society Presidency of the LDS Church presented on the international charitable and emergency relief work of LDS Charities. The LDS Church gained prominence as a result of this session as a first responder and charitable partner with several other aid agencies. The standard of presentations was extremely high. 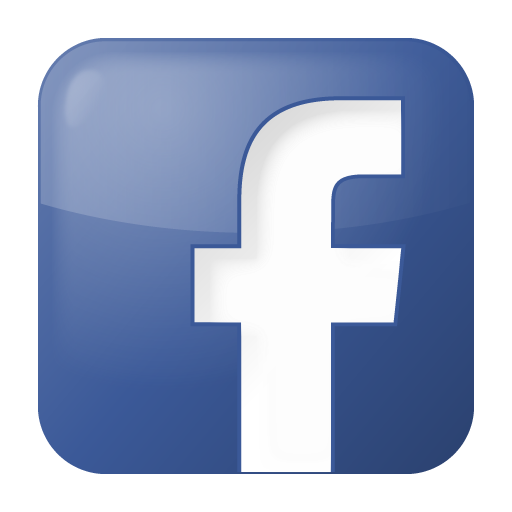 At a dedicated session held as a part of the Adelaide sessions on 16 February 2018 all in attendance agreed to produce a substantial academic book and possibly other more generally accessible publications from the papers and proceedings of the conference. Professor Brett Scharffs, (BYU); Professor Michael Quinlan, (Dean, Notre Dame Law School); Professor Paul Babie (University of Adelaide Law and Religion Project, Research Unit for the Study of Society, Ethics and Law); Professor Carolyn Evans (Deputy Vice-Chancellor and Deputy Provost, University of Melbourne); Dr Keith Thompson (Assistant Dean, Notre Dame Law School); Professor Alex Deagon (Queensland University of Technology); Archbishop Porteous (Catholic Archdiocese of Hobart); Professor Rick Sarre (University of South Australia Law School); Dr Joel Harrison (Macquarie University Law School); Dr Paul Taylor (University of Notre Dame Law School); Professor Neville Rochow SC (University of Adelaide, Australia); Professor Eugene Tan (Singapore Management University); Jessica Giles (Open University, UK); Simon McCrossan (Evangelical Alliance, UK); Professor Patrick Parkinson AM (University of Sydney Law School, Australia); Dr Jeremy Patrick (University of Southern Queensland School of Law and Justice, Australia); Reverend Peter Kurti and Bishop (retired) Robert Forsyth (respectively Senior Research Fellow and Senior Fellow, Centre for Independent Studies, Australia); Sharon Eubank (Director, LDS Charities, United States); Professor Pauline Ridge (Australian National University); Mark Fowler (University of Queensland; Notre Dame Law School, Australia); Fearghas O’Beara (Adviser to the Vice-President and Secretary-General of the European Parliament, Belgium); Professor Mark Hill QC (Cardiff, UK); A/Professor Neil Foster (University of Newcastle Law School, Australia); the Honourable Phillip Ruddock MP (Former Attorney-General; Chair of the Expert Panel, Department of the Prime Minister and Cabinet) and Panel Members Professor Rosalind Croucher AM, the Honourable Dr Annabelle Bennett AO, SC, and Professor Nicholas Aroney; Professor Zachary Calo (Hamid bin Khalafi University, Qatar); Joshua Forrester (Murdoch University, Australia); Professor Augusto Zimmerman (Sheridan College, Faculty of Business, Australia); Dr Ping Xiong (University of South Australia Law School); Dr Brian Adams (Director, Centre for Interfaith and Cultural Dialogue, Griffith University, Australia); Dr Renae Barker (University of Western Australia). No conference of this size and importance can be a success without the contributions of many who have assisted in the planning and execution behind the scenes. Special acknowledgment and thanks go to the students and staff of each of the university law schools who worked unstintingly to ensure success. In addition, thanks go to the Andersens and Murdocks from the Auckland office of the LDS Church Area Legal Counsel, who stepped in to add to the great work of the student volunteers. The combined work of all who graciously volunteered made the conference a success. On 1 February 2018, Shaun Casey, former U.S. Special Representative for Religion and Global Affairs, visited the BYU campus to deliver a lecture titled “Globetrotting for Interfaith Harmony” in celebration of the United Nation’s annual World Interfaith Harmony Week. The event was co-hosted by the Wheatley Institution; the Richard L. Evans Chair of Religious Understanding; the International Center for Law and Religion Studies; and the College of Family, Home, and Social Sciences. Prior to the lecture, Casey visited the Center to have lunch and talk with BYU Law students. In a casual setting, he talked about his experiences in the State Department’s Office of Faith-Based Community Initiatives and shared some of his thoughts on freedom of religion or belief. He answered questions posed by the students and spent several minutes after the lunch ended talking individually with students. Watch this page as we highlight reports from our oustanding Student Research Fellows. See New Items on the People Page! 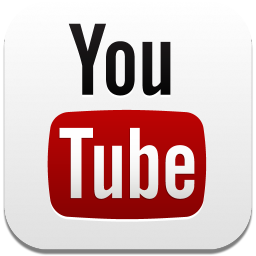 The Center is on Facebook, YouTube, and Twitter. 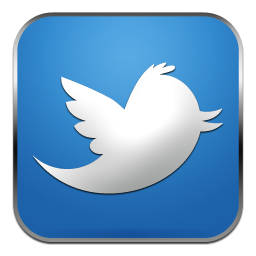 Visit soon and often! The 16 January 2012 Newsletter of the International Center for Law and Religion Studies has now been sent to friends and subscribers. You may subscribe or unsubscribe to the Newsletter, or submit questions or comments about the Newsletter, by sending a message to newsletter@iclrs.org. All Center newsletters may be viewed here.